Note: The Canon Speedlite 430EX Flash has been replaced by the Canon Speedlite 430EX II Flash. An external flash such as the Canon Speedlite 430EX Flash are one of the most popular accessories among Digital SLR (and film SLR for that matter) owners. Why? Why use an external flash? The answer may be obvious to owners of camera bodies without a built-in flash, but not so clear to those using bodies with a built-in flash. The built-in flash is great for fill flash to light the shaded areas (such as people's eyes) in a pictures. To use fill flash, set your exposure for the ambient light, then dial in -1 to -2 EV FEC (Flash Exposure Compensation). The built-in flash is also useful to add catchlights (sparkles) in a subject's eyes. Accessory flashes such as the Canon Speedlite 430EX Flash and Canon Speedlite 580EX Flash feature tilt and swivel heads which allows them to redirect the light toward a larger white reflective surface such as a ceiling, wall, piece of white foamcore, commercial reflector ... Thus, the main light becomes the wide reflecting surface being used and the broad light source creates a much softer, less flat and far more pleasing image. The swivel and tilt features allow the 430EX to be aimed as desired. In addition, flash modifiers such as the Sto-Fen Omnibounce Diffuser and many others can be used with accessory flashes to create a broader lighting surface for direct flash, bounce flash or a combination of both. The wireless (or corded) remote capability of Canon's Speedlite flashes offer even far greater advantages. An accessory flash can be mounted on a bracket to allow specific placement of the flash in relation to the camera. An accessory flash can be mounted in a softbox or umbrella for superb lighting - typically better than possible with just fill flash and good ambient lighting. Multiple wireless remote flashes can be setup for a highly portable, complete professional lighting setup. The Canon Speedlite 430EX Flash and other Canon Speedlite Flashes provide a red patterned focus assist beam - enabling focusing in complete darkness within range (up to 20-30' depending the flash model, camera body/lens being used and available light). See the red window on the front of the flashes? The built-in flashes can provide focus assist as well, but they use a far more dramatic series of bright white flashes. An additional significant reason to use an external flash over a built-in flash is the amount of lighting output the external flash can provide. For example, the Canon EOS Rebel XT/350D DSLR 's built-in flash effective range (Guide Number) is 42' (13m) vs. up to 141' (43 m)(ISO 100 at 105mm) for the Canon Speedlite 430EX Flash. Once you know why you need an accessory flash, the decision becomes "Which one?" The Canon options in my opinion are the 430EX or 580EX. Canon makes a 220ex, but it is rather featureless. Pictured above from left to right are the Canon Speedlite 580EX E-TTL II Flash and the smaller Canon Speedlite 430EX E-TTL II Flash. One of the primary differences between the 430EX and the 580EX is the amount of light each can provide. The 430EX has a Guide Number of 141' (43 m) while the 580EX has a Guide Number of 190' (58 m) (both at 105mm). The 430EX is not under powered for many uses, but the 580EX's significant power advantage can become important when using a flash modifier such as an umbrella, softbox or diffuser - or bouncing light off a high ceiling. In addition to being more powerful, the 580EX allows 1/1 (full power) to 1/128 power in 1/3-stop increments while the 430EX allows power settings from 1/1 to 1/64 in more granular 1-stop increments. The other primary difference is that the 580EX can be used as a master to trigger remote Canon wireless slave flashes while the 430EX can only act as a slave flash. Any number of Canon 430EX, 420EX, 550EX and 580EX Speedlites can be combined as slave units but only the Canon 550EX and 580EX Speedlites can act as slave masters. In addition, the Canon Macro Ring Lite MR-14EX, Macro Twin Lite MT-24EX, or Speedlite Transmitter ST-E2 can be utilized used as wireless slave flash masters. Many people start out with a Canon Speedlite 430EX Flash (or started out with 420EX) and later move up to a 580EX. The 430EX can then be used as a remote flash. Those using Canon bodies with 45 focus points (1-Series boies) should take note that the 430EX's AF assist covers up to 9 focus points. You can still utilize the 430EX's focus assist, but need to know that all focus points are not covered as in the 580EX. The fact that the 580EX can be powered from an external power source will be important to photographers expecting heavy flash use. The 430EX does not have this capability. While the 430EX head moves up/down from 0 to 90°, left from 0 to 180°, and right from 0 to 90°, the 580EX allows an additional -7° down and a full 0-180° rotation right. While both flashes feature a pull-out/flip down wide angle diffuser to cover lenses out to 14mm (FOVCF equivalent), the 580EX includes a white plastic pull-out catchlight reflector panel in addition. The Canon Speedlite 430EX Flash features 6 custom flash function settings, the 580EX features 14. Instead of a dial for adjusting settings, the 430EX utilizes rounded parenthesis-shaped buttons. I can understand making buttons safe from accidental changes, but these buttons are narrow and require an excessively deep press to make changes. The dial is much easier to use. If any of the 580EX advantages are important to you, buy the 580EX. Otherwise, read on. The 430EX does have some advantages over the 580EX. Size and weight are the most obvious physical advantages. 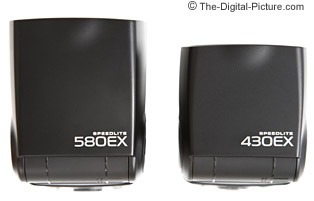 The 430EX is 14% lighter and about 25% smaller in overall volume than the 580EX. Actual 430EX dimensions are 2.8 x 4.8 x 4" (72 x 122 x 101mm) WxHxD. Actual 580EX dimensions are 3 x 5.3 x 4.5" (75 x 134 x 114mm) WxHxD. Without batteries, the 430EX weighs 11.6 oz (330 g) and the 580ex weighs 13.2 oz (375 g). The Canon Speedlite 430EX Flash also features an improved battery door over Canon's previously introduced flashes. It works very nicely. A nicer padded nylon (vs. vinyl) pouch with hook & loop closure is included. Lower cost is a 430EX advantage we can all appreciate. However, I'm not sure the cost difference is enough less to justify the difference in features. 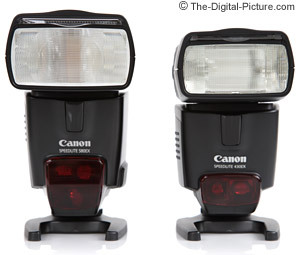 The Canon Speedlite 430EX Flash is a direct replacement for the Canon Speedlite 420EX flash. While the 430EX has significant feature advantages over the 420ex, I am somewhat disappointed that the 420EX was discontinued as it represented a very good value. Yes, the 430EX has a higher cost - its only disadvantage to the 420EX. The list of 430EX advantages/improvements over the 420EX is long. Like the 580EX, the 430EX utilizes a single button release for both the tilt and rotate locks (two separate buttons are required to be pressed to adjust the 420EX). 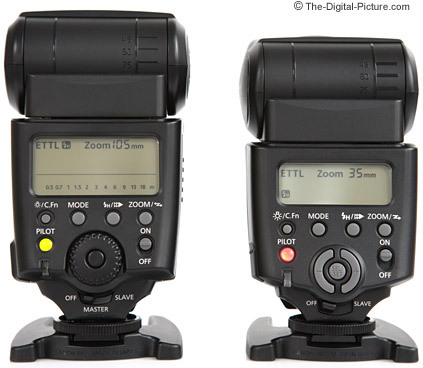 A single grip/button press allows the flash head to be rotated and tilted at the same time. The single button release is a really nice enhancement. Unlike the 420EX, the 430EX has a Manual Flash Mode with flash output adjustable from full to 1/64 power (7 levels). If your subject is consistent (formal portraits for example), a manual flash output setting can eliminate shot-to-shot exposure variations. Manual control of the flash head zoom is also a differentiating feature. FEC (Flash Exposure Compensation) can be set directly on the 430EX in 1/3 stop increments up to +/- 3 stops. The 420EX required a camera body with this feature built in to use FEC. Improvements in circuitry make the 430EX recycle time 40% faster than the 420EX with a slightly increased max Guide Number. Like the 420EX, the 430EX is powered by 4 AA-size Alkaline Batteries (6V) or 4 AA-size NiMH Rechargeable (4.8V). Full power recycle time is 3.7 Seconds with alkaline batteries or - note this - 2 Seconds with NiMH batteries. NiMH batteries have much less internal resistance than Alkaline batteries resulting in significantly shorter re-cycle times. NiMH batteries also give more consistent (full) power until they are discharged while Alkalines will recycle the flash more and more slowly as they expend their life. Adding environmental concerns and cost to this equation should make the decision to use NiMH batteries a no-brainer. Buy 40 or 50 of them and use them in everything you own that accepts them. Buy a charger that charges the AAs in 60 minutes or less to make charging time less of a issue. The 430EX includes an LCD panel on rear of flash, the 420EX instead uses a series of lights. The Canon Speedlite 430EX Flash includes an integrated diffusion panel that covers a 14mm lens (on a full-frame camera), the 420EX does not have this feature. Without the panel in place, both flashes cover a 24mm or greater focal length lens. Both flash heads zoom to cover a 24mm to 105mm focal length range. Of course a longer focal length lens can be used, but flash output will be wasted to the sides of the covered field of view. The 430EX indicates the flash zoom setting on the LCD (instead of using a series of lights). The 430EX also features auto conversion of flash zoom coverage with compatible FOVCF digital SLRs. The flash coverage is adjusted to optimally cover the camera's sensor size. "This has the effect of eliminating light loss in peripheral areas and extending the effective flash range." [Canon] And, battery life can be extended. When a compatible digital SLR's white balance mode is set to Auto White Balance (AWB) or Flash White Balance, color temperature information can be communicated with the Canon Speedlite 430EX Flash resulting in optimum white balance. A new 2-LED focus assist beam is compatible with all EOS AF systems up to 9-point AF (the 420EX supported 7 focus points). The 430EX supports distance-linked E-TTL II (Evaluative Through The Lens version II) flash exposure technology. The 430EX has an upgraded styling for those concerned about appearances. So, the Canon Speedlite 430EX Flash has many upgrades from the 420EX it replaces. Otherwise, it has all of the basic functions expected to be included in a flash of this caliber including High-Speed FP Sync Mode, Rear Curtain Sync, SE Save Energy, and FE Lock (spot/partial flash metering), 1st and 2nd curtain flash synchronization. And as always, a mini stand is included. Performance of the Canon Speedlite 430EX Flash is consistent with that of the Canon Speedlite 580EX Flash - very good. I don't have much to report on it. 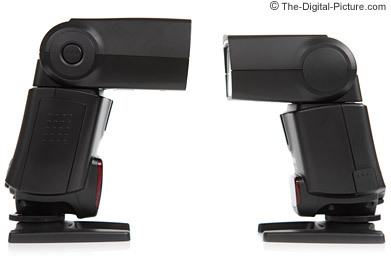 Both of these flashes work very well as long as you understand Canon's flash technology. For the difference in price, my advice is to get the Canon 580ex Flash. Of course, if the 430ex's differences are meaningless to you, it will serve you very well.